In 1929, the financier George Perkins, his wife Linn, and his mother Evelyna Ball Perkins, purchased land that became Glynwood Farm. They brought with them a deep conservation ethic, inspired by Mr. Perkins’ father—George Walbridge Perkins—who in the late 19th Century led the way to the creation of the Palisades Interstate Parkway Commission, and served as its first President. To date, the Commission has conserved more than 100,000 acres of land in New York and New Jersey. Upon Mrs. Perkins’ death in 1993, her family preserved the property and made it a center dedicated to conservation and community stewardship. With help from Open Space Institute and its Open Space Conservancy and funding from the Lila Acheson and DeWitt Wallace Fund, 1,700 acres of forested uplands became part of Fahnestock State Park. The 225-acre core is now Glynwood. 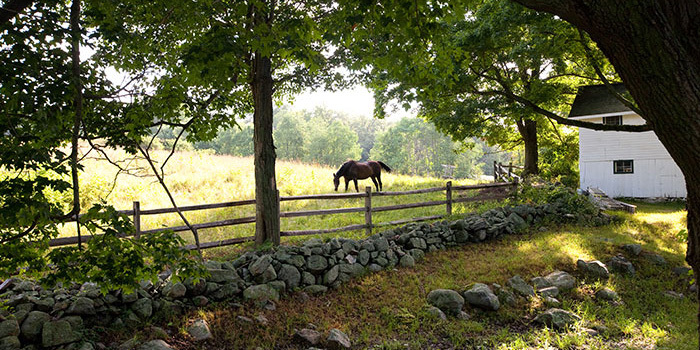 The Perkins family created an endowment to help maintain our facilities, which include a convening center, administrative offices and accommodations for retreats and events, all situated on a teaching farm for apprentices in-residence. In 2017, Glynwood celebrated its 20th anniversary as a nonprofit organization. Our expanded mission and programs continue the legacy of our founders and bolster the region’s health, prosperity and cultural vibrancy. To honor and commemorate this important milestone, in September 2017, we published a limited-edition paperback imprint, the proceeds from which support our mission and programs.